Hygrothermal simulations such as WUFI are coming into increasingly common use among building science researchers and practitioners, architects and designers, and energy analysts. Such simulations have been shown to be powerful and validated tools. However, with increasing dissemination of these types of modeling tools–most notable WUFI–less-experienced or less- informed practitioners have run models that provide unrealistic results (typically overly conservative). In some cases, these results clearly contradict extensive field experience and known history of assemblies, showing failure when they do not occur in reality. In other more worrisome cases, models run on assemblies that clearly have not performed historically show successful performance. This has resulted in confusion in the building industry—specifically, problems with advancing knowledge of moisture-safe building enclosure/shell assemblies. Christopher Schumacher, as an experienced user of WUFI, regularly fields questions from less- experienced users who are setting up models. He has helped these practitioners tune their models closer to reality; walked through a typical exchange with a new practitioner. Some key weaknesses he found in his interactions is that there is limited or uncertain material property information, many users are use default configurations due to ignorance instead of choice, and many do not understand the underlying physics. He recommended more education to users, better material properties, and more field experience/monitoring. Lois Arena covered work monitoring high-R (double stud) walls, simulations of these walls, and interactions with ASHRAE Standard 160. In multiple projects, including both field monitoring and simulation, ASHRAE 160 showed that assemblies were failing, while no such endemic failures occur in practice or were in evidence in measured moisture contents. The ASHRAE 160 committee is considering changes to the standard, including adoption of the VTT Finland mold index. In addition, Arena noted that the initial condition (80% RH) recommended in ASHRAE 160 seemed consistently high. Vladimir Kochkin presented results from monitoring sheathing moisture contents in a broad survey of houses (20+ homes in multiple climate zones), and test hut monitoring work in Maryland (Zone 4A). Many of these walls had exterior foam, to meet requirements in the 2012 IECC. One general pattern that "safer" designs (more exterior continuous insulation/less cavity insulation) generally had lower wintertime moisture contents, but with some exceptions. The results also allay builder concerns that exterior foam impedes drying; drying to the interior was in evidence. He also questioned ASHRAE 160 criteria as being overly conservative. In addition, he questioned the common wisdom of 20% moisture content as a risk condition; it is known that no damage will occur under 20% MC, but the inverse (damage will occur above 20%) is not as clear. This is consistent with the field disassembly conducted of walls that hit 20% MC in wintertime. Test hut work indicated, among other items, that walls with Kraft-faced batt (Class II) were less sensitive to interior RH; controlling interior RH is critical if Class III vapor retarders are being used. Samuel Glass covered WUFI simulations on the test hut data discussed previously; results were examined to see if they correctly captured general wetting and drying trends; it was not intended as a model validation effort. Key research covered OSB response to interior RH conditions, north vs. south wall orientation, and Kraft facing vapor retarders (Class II) vs. latex paint (Class III). Correlations between simulations and measured data were reasonable, with some exceptions. In general, high interior humidity levels (40-50% in winter) resulted in significant moisture accumulation (20%+) in walls with a Class III vapor retarder (latex paint), particularly north- facing walls, and moisture accumulation was not significant in walls with an interior Kraft vapor retarder (Class II). Also, simulations tend to under-predict OSB MC during summer, particularly for stucco and manufactured stone veneer (simulation drier than reality). Achilles Karagiozis first explained that ASHRAE Standard 160 should not predict typical interior or enclosure conditions in the field; instead, the intent of 160 is to provide design or worst-case conditions. It is entirely possible that they are currently too high (and should be less stringent), but the ultimate intent is to provide a safety factor when designing building enclosures. He stated that the ASHRAE 160 simplified method produces unrealistic results, but the intermediate method produced better results. He then covered the role of WUFI, stating that is used by experts to create useful results—but ultimately, “the tool is only as knowledgeable as the user.” Others in the audience questioned the level of expertise being proposed here: a high bar would limit practitioners to a small fraction of the current users. Joseph Lstiburek then covered BSC’s upcoming work under Building America (Task Order 5), which is to generate a series of WUFI files of common North American wall assemblies that have historically provided good performance. The behavior of these assemblies can then be examined, to determine appropriate failure criteria based on this historic record. This is intended to counter much of the common, existing modeling which shows that walls known to perform well (historically) do not meet various failure criteria. Each of these wall assemblies will be accompanied by a short case study, which explains the history of the wall, how it works (hygrothermally), the function of each component (air barrier vs. vapor retarder vs. water control), and the thought process behind the design. This was followed by a group discussion on various topics. One topic was WUFI and the user base’s expertise, and training. The general consensus was that trying to limit access to WUFI is a non-starter. Instead, the correct approach is to provide education; the template files described above are a step in the right direction. In addition, a fundamental issue is that this field needs to determine who is qualified to make these engineering judgments. There was broad support for better material property data; the key question is how industry will support the funding of the material property testing, and dissemination of the data. Failure criteria were discussed; in addition to ASHRAE 160 criteria, the VTT mold index, sheathing moisture content, and WUFI moisture year-to-year trend data were brought up as options. Hygrothermal simulations such as WUFI (Künzel 2002) are coming into increasingly common use among building science researchers and practitioners, architects and designers, and energy analysts. Such simulations have been shown to be powerful and validated tools that predict hygrothermal behavior of enclosure assemblies. Simulation developers have continued to expand the capabilities of such tools over time. However, with increasing dissemination of these modeling tools–most notably WUFI–less- experienced or less-informed practitioners have run models that provide unrealistic results (typically overly conservative). In some cases, these results clearly contradict extensive field experience and known history of assemblies, showing failure when they do not occur in reality. In other more worrisome cases, models run on assemblies that clearly have not performed historically show successful performance. This has resulted in confusion in the building industry—specifically, problems with advancing knowledge of moisture-safe building enclosure/shell assemblies. Development of moisture-safe enclosure assemblies is a component that will contribute to the Building America target of reducing residential carbon emissions 20% by 2020 and 80% by 2050. 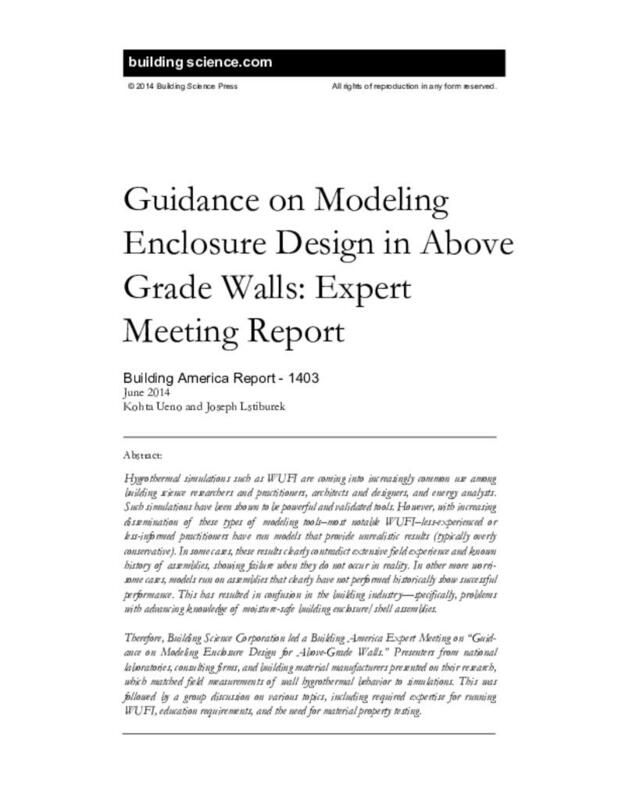 Develop guidance on design methods for enclosure design with a focus on above- grade walls; guidance to be provided for both new construction and retrofits in all U.S. climate zones. Review wall assemblies and conditions that provide proven performance in each climate zone. Review ASHRAE Standard 160 (ASHRAE 2009) and WUFI (Künzel 2002) analysis of these wall assemblies and conditions. Review modeling boundary conditions and failure thresholds. Building Science Corporation held an Expert Meeting on "Guidance on Modeling Enclosure Design in Above Grade Walls Interior," on May 12, 2014 at the Westford Regency Inn and Conference Center in Westford, MA. There were 26 in attendance; participants included building science researchers, product manufacturers representatives, and representatives of the press. Invited speakers gave presentations in their particular area of expertise. The presentations were followed by an open discussion moderated by Joseph Lstiburek of BSC, on the topics of where hygrothermal modeling resources should be directed to increase accuracy and applicability of simulations, as well as BSC's planned research work for Building America TO5 (calendar year 2014). . .